Aloha Honolulu bike commuters – a last minute post to let you know about three exciting events tomorrow through HBL. Get your bike on! ->_Cyclists please attend the City’s workshop tomorrow on TOD – Transit Oriented DevelopmentBe prepared to listen to some great speakers who have made TOD happen elsewhere and participate. Just show up and register at the Walk In table. Celebrate “Cultivating Community”,” with a diverse group of people and 13 speakers & performers representing various fields, such as technology, entertainment, art, science, and education. Respected thought leaders and community organizations of Hawai‘i, like Ian Kitajima of Oceanit, Pacific Tongues, Henry Kapono and many more will share their personal and professional insights on how we can cultivate community and drive social change. Tickets at the Hawaii Theatre Box Office, online at or by phone at (808) 528-0506. Become a member and join a growing group of 1,219 who are committed to making Hawaii a better and safer place to ride a bicycle. Join or donate to help us continue pushing forward bicycling progress for Hawaii! 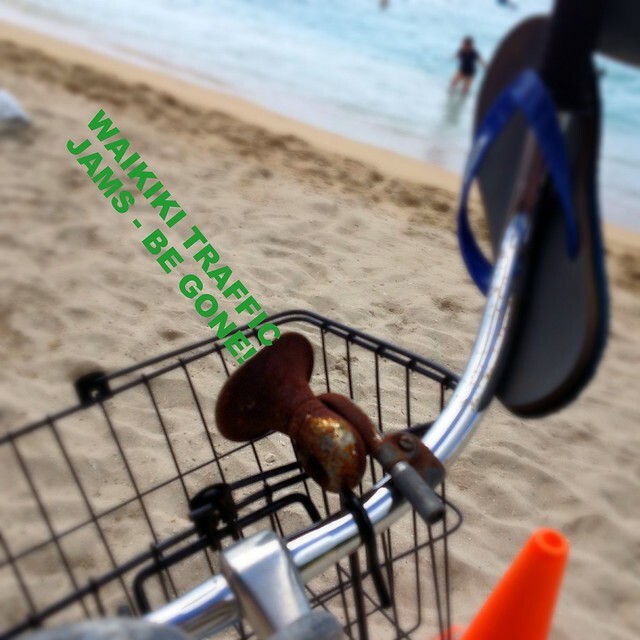 News: Traffic Backup in Waikiki Calls for More Bikes! So Matt must’ve been dreaming of sunny days and bad traffice in Waikiki when he sent me this article reblogged from the Honolulu Star Advertiser: Hawaii Tries To Solve Transportation Mess With Bike-Sharing Recommended. The article interviews a local bike commuter who works at the Hilton who apparently reduces a Friday night typical hour-long traffic-jammed no-aloha car commute to a simple 15 minute bike ride to his house in Kaimuki. Maybe an exaggeration, but maybe not? I’ve never driven through Waikiki on a Friday at pau hana. The rest of the article talks about possible solutions – (mostly TheBarfBus related), including a bike share program. Bike share has been on the brain forever on Oahu, with some pilot stations up and running in Kailua by B-Cycle. The study found Waikiki already has urgent transportation problems, including unreliable bus service, traffic congestion and a shortage of parking spaces, Frysztacki said. –Provide more frequent bus service to Waikiki with fewer stops. –Implement pre-boarding bus fare payment and all-door boarding. –Coordinate bus information with improved signage and electronic displays. –Create a 7-mile pedestrian and bicycle core network that considers building pedestrian and bike paths over the Ala Wai. –Provide real-time parking information displays. Waikiki is almost another animal, apart from the rest of the island. But for those of us who live in Honolulu, or those of us who commute through Waiks, or for those of us who have visited and wished for better traffic patterns… keep your fingers crossed for some bike share action in the future. Maybe better bike share and transit options will roll around eventually! This is an easy family event along the mostly flat scenic routes of the North Shore out of Haleiwa! Click on this link to see the google map. As usual, you can choose how far you’d like to ride. Contact bicycle@hbl.org for more info. Hi guys and Happy Aloha Friday to all! It’s Hawaii Bike-O time, so tune in if you have time for some fun summer bike events. This popped into my email box the other day, and the first event starts tomorrow for all of you Honolulu Bike Commuters out there. Here we go, the Hawaii Bicycling League has plenty of fun shiz planned for this summer, don’t forget to sign up for Honolulu Century Ride heat stroke time on September 30, 2012! There’s everything going down from Commuter Cycling 101 classes, stuff for the kids, ukuleles and PSA’s, and new laws for cyclists and pedestrians. Hawaii Five-O cast stalking, so much easier by bike. Zach’s Ride Opens Pearl Harbor Bike Path Gate! Together with the Manago family and friends, HBL organized the second annual bike ride in honor of Zachary Manago. Zach’s Ride in Paradise 2012 was organized on July 7 and 8 across Oahu in effort to raise awareness of bicycling safety and to help realize Zachary Manago’s dream nearly a year a half after the fatal collision. Zach Manago was passionate about safer bicycling facilities and wanted to make Hawaii safer so that more people could ride their bikes. HBL got special permission to ride through the Admiral’s Boat House gate on the Pearl Harbor Bike Path. About 241 bicyclists participated in the ride around the island in remembrance of Zach. Find more pictures and videos on HBL’s Facebook or Ryan’s Flickr page – Day 1 and Day 2. On Saturday July 21st, Kapolei Commons is co-sponsoring a FREE Bike Safety Rodeo for keiki in 3rd through 6th grade, 9 am to 12 noon, with HBL. A bike rodeo is a special event where kids are given a safe environment to try out their cycling skills and learn how to ride safely. We will teach kids and their parents about helmet fit and safety, bike fit, bike laws, hand signals and bike handling drills. Every child that participates in the Bike Safety Rodeo will receive a FREE bike helmet provided by ThinkFirst, a non-profit organization committed to brain injury prevention programs. Hawaii Bicycling League and the League of American Bicyclists will also provide TWO, one-hour Adult Bike Education courses with a video presentation and handouts. Come and find us next Saturday in the parking area to the left of Sports Authority. There are 75 spots available for keiki ages 8-12 years old. There are three classes available: 9, 10 and 11 am (Each class is one hour long). Pre-registration is required. Kapolei Commons is located at 4450 Kapolei Parkway. Starting July 2012, HBL will be offering a Commuter Cycling 101 class at Leeward Community College! 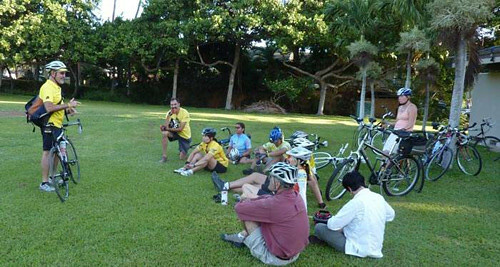 Commuter Cycling 101 is a 2-hour introductory course on riding your bicycle in Hawaii, following bicycle traffic laws and being safe while commuting. With a League of American Bicyclists certified Instructor, 30 minutes will be spent in a classroom learning how to navigate Hawaii’s roads and interact with pedestrians and motorists. Another 30 minutes will be spent practicing defensive bicycling skills in a safe and controlled parking area. One hour will be spent implementing these practices and developing your skills on a group safety ride through the local neighborhood. The course fee is $15; Participants must be 18 years of age or older, have a functional bicycle with front and rear brakes, and a properly fitting helmet. Classes will be in session on Saturday, July 28 and Saturday, October 13, 9-11am. You can register for the class here. Please view our safety tips and videos at hbl.org/bikeakamai, and read the resources we have for beginner bicyclists. Check out Jake Shimabukuro’s public service announcement reminding drivers that bicyclists may use the full lane for their safety. Drivers should follow bicyclists at a safe distance until it is safe to pass, then signal and give plenty of space when passing. If all drivers understood that this is the law (HRS 291C-145), cyclists would face less danger on the roads. If a driver yells, honks, drives aggressively close, or speeds by you as a cyclist, take their license number and call 911/nonemergency when you get to your destination. Give the time, location, and make/model/color of the vehicle. An officer will come to your location. Let the officer know that the driver was driving dangerously, and ask the officer to contact the driver to explain the law. This is how we should inform dangerous motorists of their actions, one at a time. Mahalo to Jake, Farmers Insurance, and HawaiiNewsNow (KHNL) who volunteered their time to produce the PSA, along with HBL members Miriam Gee, Nick Blank, and Chad Taniguchi. Motorists are on notice now that they face harsher penalties if they kill or seriously injure a pedestrian, cyclist, police officer or other unprotected road user while violating the law. Effective on July 10, 2012 the lawreminds motorists to be especially careful when they see Vulnerable Users on the roads. The Hawaii Bicycling League, the Honolulu Police Department, and other advocates pushed for this bill at the Legislature. Everyone has a right to be safe on Hawaii’s roads. No one needs to die on the roads. We just need to follow the laws, drive the speed limit, and care about other roads users more than about our personal convenience. Let’s eliminate deaths from speeding, inattention, driving under the influence of alcohol/drugs, and violating other traffic laws. Ride Aloha, Drive Aloha! City Departments are now required to seriously consider the needs of pedestrians and bicyclists when planning repair or construction of streets. Bike lanes, sharrows, “bikes may use full lane” signs, sidewalks, and crosswalks must be installed unless there is a good reason not to. The burden now shifts to the City to explain why a bike and pedestrian facility cannot be installed. If this ordinance had been in effect earlier, the City would have had to consider installing bike lanes on Waialae Avenue during the planning stage of the Waialae Avenue repaving, thereby having designs, community and small business outreach in place when repaving begins. HBL will advocate for the release of the future paving schedule, compare the list of bike lanes on the City’s bike plan, and work with the various departments (Transportation Services, Design & Construction, Facilities Maintenance, and Planning & Permitting) so bike lanes and facilities already planned are actually implemented. If you want to be on this committee, please email Chad Taniguchi at chad@hbl.org. The next streets to pay attention to are Young Street and South Beretania Street. Mahalo to AARP, American Planning Association, Department of Health, and many HBL members for working with City Council Members (especially Transportation Chair Breene Harimoto) and Neighborhood Boards to gain support. On Sunday, August 26th Cyclovia Hawaii will host a bike education and promotion event for adults at Hekili Street and Enchanted Lakes Community Park from 9am to 4pm. The event is about promoting physical activity and will include bicycle education, routine bike maintenance and repair, bike rides to the Marine Corps Air Base and Enchanted Lakes Community Park, Zumba and other activities. A Cycle On Runway will showcase the unique cycles of local bike clubs and groups. Please contact Jeff Ideta at heleonkailua@gmail.com to volunteer. The event is sponsored by Cycle On Hawaii, a new charitable nonprofit organization that was formed to encourage cycling and support the Safe Routes to School program. Okay Cycle ladies and gents, now I’m back to stalking Grace Park as they film Five-O in Kaka’ako. I hear she’s super tall in real life.